Located in a southwest Rochester neighborhood, Mayo Foundation House was built between 1916-1918 as the residence of Dr. and Mrs. William J. Mayo. In 1938, Dr. and Mrs. Mayo donated the home to Mayo Clinic as a meeting place “for the good of mankind.” Known since then as Mayo Foundation House, the home is reserved for Mayo Clinic meetings and events, and not open to the public. The Board of Trustees meets at Mayo Foundation House, and many dignitaries have been guests there. The Mayo Foundation House property includes several other buildings, including Damon House, formerly Dr. and Mrs. Mayo’s retirement home, and Walters House, formerly the home of their daughter, Phoebe, and her husband, Waltman Walters, M.D. 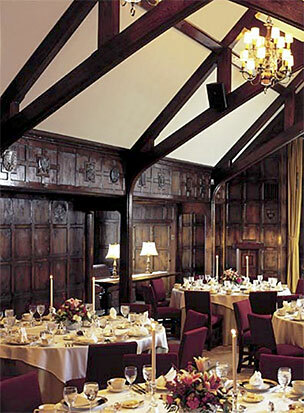 Mayo Foundation House is of English Tudor Revival design, reflecting the Mayo family’s English ancestry. The materials, however, are native to the Midwest. Exterior walls are of Kasota stone, quarried in Minnesota near Mankato and St. Peter; the roof is green slate from Lake Superior.